Macklemore can put all words together and make a cool and hip rap song, but this is not the only reason why Macklemore has become a hot trend. He looks sizzling hot because of the clothes he wear but more so because of his hair. His hairstyle brings a neat look, yet still appears edgy. It is an inspiration not only for men, but also for women, like Miley Cyrus for example. And don’t worry because you can be as hot looking as Macklemore with his hairstyle. Here’s a simple guide to have the style. and a wax. 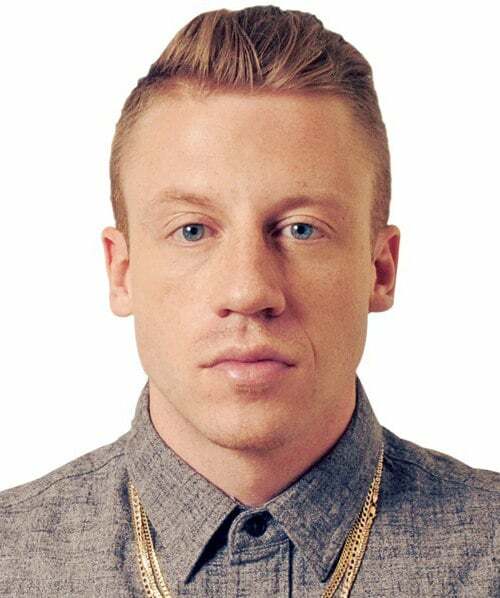 In one of his interviews, Macklemore mentioned that he uses a product called Laid Back Shaggy Look Cream . So if everything is set, let’s get started. Let’s first do the initial touches. Wet your hair by sprinkling some water on it. Clip the hair on the top of your head that you desire to keep. It is suggested to keep about five inches. Shave the back and the sides of your head using a clipper and a guard that can be no. 1 or no. 2, but no. 1 is recommended. Comb back the hair that you’ve left and cut it straight. It is of course advised to do it little by little. Pull the hair back to cut it. By cutting it gradually, the front will be longer than the ones at the back. This will give you an angle and more ways to style it. If you feel that the front hair is too long, you can freely cut until the desired length is done. Blow dry your hair while brushing it, comb it back. Now, you can style it the way you want by using a wax or a cream. The product will hold the hair together. Get an enough amount of wax in your hands to style it, and then apply it to the hair using your hands. You can follow Macklemore hairstyle by slipping it back or you can make a revision by slipping it on the left or right side. You can also blow dry it and let it be that way. Thanks Suwarnaadi for the guide and procedure for having Macklemore hairstyle. His hairstyle brings a neat look, yet still appears edgy. It is an inspiration not only for men, but also for women, like Miley Cyrus for example. I’m sure many did this style now. Thank you for sharing this.